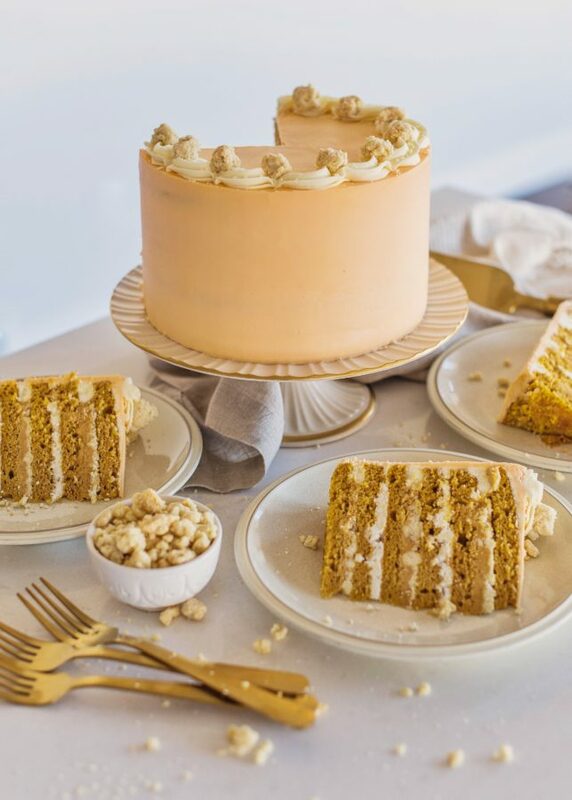 Pumpkin Pie Cake – six pumpkin cake layers with toasted marshmallow filling, pumpkin pie filling, shortbread crumbs and vanilla buttercream. As most of you know by know, I’m not the biggest fan of pie. I know it’s shocking to some of you. And I’m pretty sure it breaks my mom’s heart every time I say those words. She spent hours teaching me how to make the perfect pie crust when I was growing up. And for pie crust, hers is definitely the best, but I just can’t get on board. I just accepted that I wouldn’t eat dessert at Thanksgiving dinner 🙂 But then, a few years ago, I tried Sweetapolita’s Autumn Delight Cake and instantly fell in love with the fall inspired flavors. I immediately thought it would be the perfect cake to serve at a Thanksgiving dinner! And so, I did it. I replaced pie with cake and it was the best Thanksgiving ever! 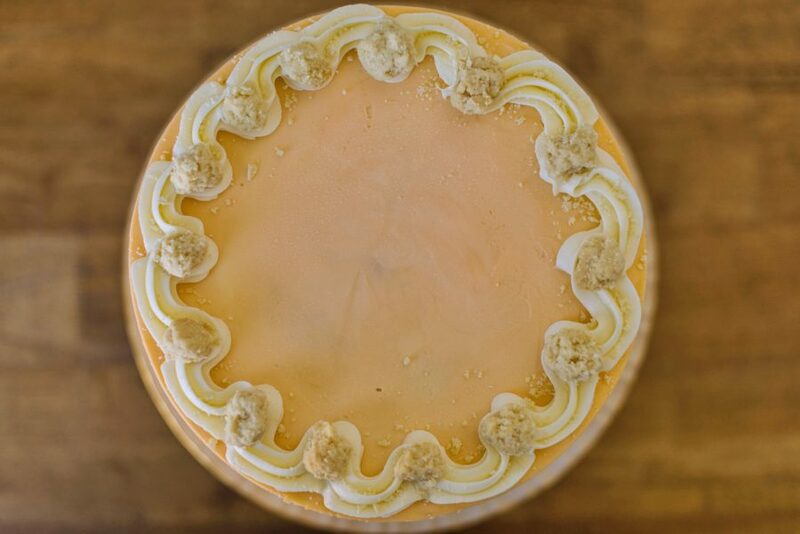 I later tried Milk Bar’s Pumpkin Pie Cake and Apple Pie Cake and became the biggest fan of pie-inspired cake. This year, I decided it was high-time I came up with my own recipes. For my pie-inspired cakes, I took inspiration from three family recipes: my mom’s Apple Pie and Ryan’s mom’s Triple Chocolate Pecan Pie and her Pumpkin Pie. In each of my new recipes, I’ve incorporated the fillings from each of these three family favorites. First up, is my Pumpkin Pie Cake. Out of the three (Pumpkin Pie Cake, French Apple Pie Cake and Triple Chocolate Pecan Pie Cake), this one is my favorite! I’ve split three layers of pumpkin cake into six thin layers to maximize the amount of fillings I can add to the cake. I then used toasted marshmallow filling, Ryan’s mom’s pumpkin pie filling and a shortbread crumb to fill each layer. The cake is then covered in a vanilla buttercream. Here’s a short video to show you how I’ve assembled the cake. I’m so excited for you to make this cake! It’s definitely the one I’ll be making for Thanksgiving dinner at my house. 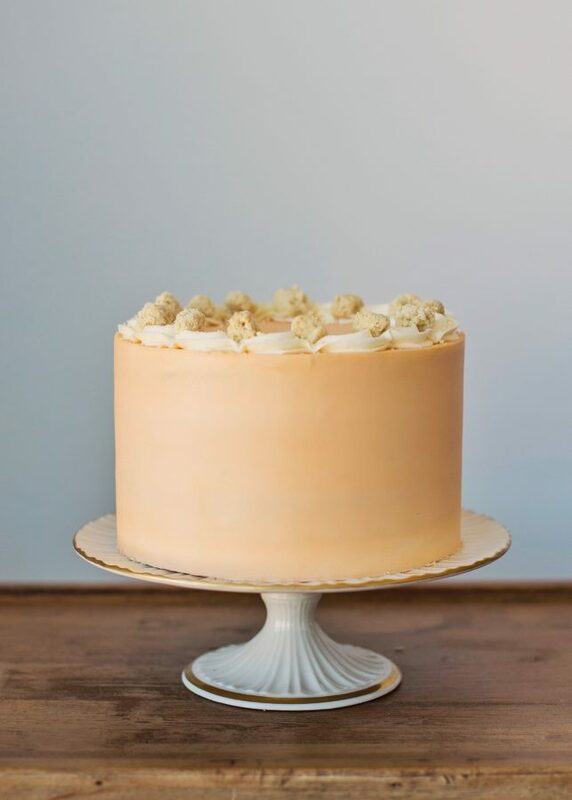 Six pumpkin cake layers with toasted marshmallow filling, pumpkin pie filling, shortbread crumbs and vanilla buttercream. Preheat 350 degrees F. Spray three 8-inch round cake pans with cooking spray and line the bottoms with parchment paper rounds. Spray again and set aside. In the bowl of an electric mixer fitted with the paddle attachment, beat the sugar and eggs together on medium-high speed until light and fluffy, about 5 minutes. Add the oil and vanilla and beat on medium until combined, about 30 seconds. Add the pumpkin filling and mix until combined, about another 30 seconds. In a medium bowl, whisk together the flour, baking powder, cinnamon, ground ginger, nutmeg, and salt, and with the mixer on the lowest speed, gradually add to the pumpkin/egg mixture. Evenly distribute batter into the prepared pans, smooth with a small offset palette knife and place in the center of the middle rack of the oven, about 2 inches apart. Bake until a knife or toothpick inserted into the center comes out clean, about 25 minutes. (Mine took 23). Let pans cool on a wire rack 10 minutes, and then invert cakes onto rack and cool them completely. Preheat your oven to 400 degrees F. Spray a 9x13 baking dish with nonstick spray. Set aside. Using a whisk, mix the sugar, brown sugar, cornstarch, cinnamon, ginger, and salt in a medium sized bowl until no lumps remain. Blend in the pumpkin, whipping cream, sour cream and eggs. Pour the mixture into the pan and bake for 50 to 55 minutes or until filling has puffed at the edges and center is almost set. Let cool completely and then move to an airtight container, mix, and then store overnight. Preheat the oven to 350 degrees F. Line a half sheet pan with parchment paper and set aside. Combine the salt and flour into a large bowl. Stir to combine. Pour in the melted butter and water. Stir to combine, until you get small clumps. Bake for about 15 minutes, until lightly golden brown on top. Place the marshmallows on a cookie sheet lined with parchment paper and sprayed with nonstick cooking spray. Place on the middle rack of the oven, and broil the marshmallows until golden brown on top, about 30-60 seconds. Keep your eye on them! Remove the pan from the oven and gently turn the marshmallows over and broil them again until they are golden brown on the other side. With the mixer on low speed, add the marshmallow cream and (cooled) toasted marshmallows, and mix for about one minute. Slice each cake layer in half horizontally, so you have six cake layers. Place the first layer on your cake board, cut side up (so bottom of the cake layer is touching the board), and spread about 3/4 cup of the pumpkin pie filling on top, followed by about 1/2 to 3/4 cup of shortbread crumbs. Gently pat the crumbs into the filling with your hands to set them in place. Place the next cake layer on top and cover with about 3/4 cup marshmallow filling. Repeat step 2 and 3 until you get to your final cake layer. Place the final cake layer, top side down, on top of the final layer of pumpkin pie filling and shortbread crumbs. Cover the cake with a thin layer of frosting and chill for 10 to 15 minutes in the freezer. This crumb coat will set the crumbs in place. Frost the cake with the remaining buttercream. I CAN NOT wait to make this recipe, Courtney! It sounds amazing! Adding it to my line up for my next family dinner! Thank you! When I found this recipe I was SO excited because I’ve never seen anything like it! I am in the process of making it right now for a “Friendsgiving” tomorrow. I just wanted to confirm that after making the pumpkin pie filling, you mix it in an air tight container and store in in the fridge overnight? Also, would you recommend wrapping the cake layers in plastic wrap and placing them in the fridge overnight until I assemble the layers tomorrow? Thanks so much! Can’t wait to try it when its done!! Yes, mix the filling and store it in the fridge. And then yes, wrap the cake layers and refrigerate overnight. I need to know the rest of the instructions for putting this cake together. After number 6 cannot read. I have been on my tablet, iPhone and computer-no luck. Will not show the rest of instructions. Also, do you add orange gel to make buttercream frosting? Do not see mention of that in frosting instructions. Please get back to me. Thank you!! I’m not sure what’s going on there. I will figure it out but there’s actually nothing past 6 – just finish frosting the cake. I did add a little orange to my buttercream. LOOKS DELICIOUS! i THINK I WILL BE MAKING THIS FOR MY FRIENDS GIVING DINNER THIS WEEK. I DO HAVE A QUESTION THOUGH. I AM A LITTLE CONFUSED ON THE PUMPKIN PIE FILLING. CAN YOU EXPLAIN A LITTLE MORE ON IT. THE LAST SENTENCE OF THE DIRECTIONS CONFUSED ME (MOVE TO AIR TIGHT CONTAINER,MIX?…). WHEN IT IS BAKED IS THIS SOME TYPE OF PUDDING CONSISTENCY? Yes, after it bakes in the pan, let it cool a bit and then you’ll want to chill it before you spread it in the cake. If you see my video, you’ll notice it’s easy to spread like a pudding (but more stable). I added “pumpkin” colored food gel. I’m in the process of making this cake right now, and every has smelled (and tasted) delicious so far. One quick note, though, I did not have enough cake batter to make 3 thick 8 inch layers. I was able to make two 1″ inch thick layers and one 1/2″ thick layer. I’m hoping my one inch layer will cut through okay despite not being super thick! I followed the directions to a tee, so not totally sure why I didn’t yield enough. Still exciting about putting this thing together in the next couple of days!! Hmm, that’s so strange. 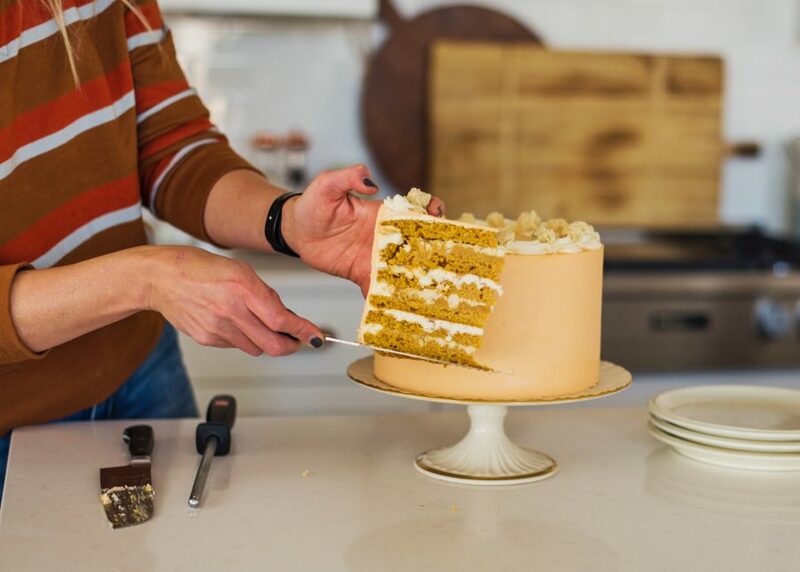 My pumpkin cake layers usually rise a bit above 1″. Sorry that wasn’t the case for you. Is your baking powder fresh? Courtney, could this cake be assembled in its entirety days in advanced and then frozen? I wondered if the freezing might alter the consistency of the marshmallow filling and/or the pie filling. Thanks in advance. I’m stoked to make this cake. Actually, no, it won’t affect the texture and flavor. I have done it with this cake already and it’s great. I recommend freezing it for an hour initially and then wrapping it entirely in plastic wrap (tightly too). The night before you want to serve it, put it in the fridge and then room temp the next day. I am committed to making this for Thanksgiving dinner. I know my family will love it! However, I have not been able to find pumpkin purée. Is it possible to make it myself out of canned pumpkin? Also, I need to make a bit smaller cake. 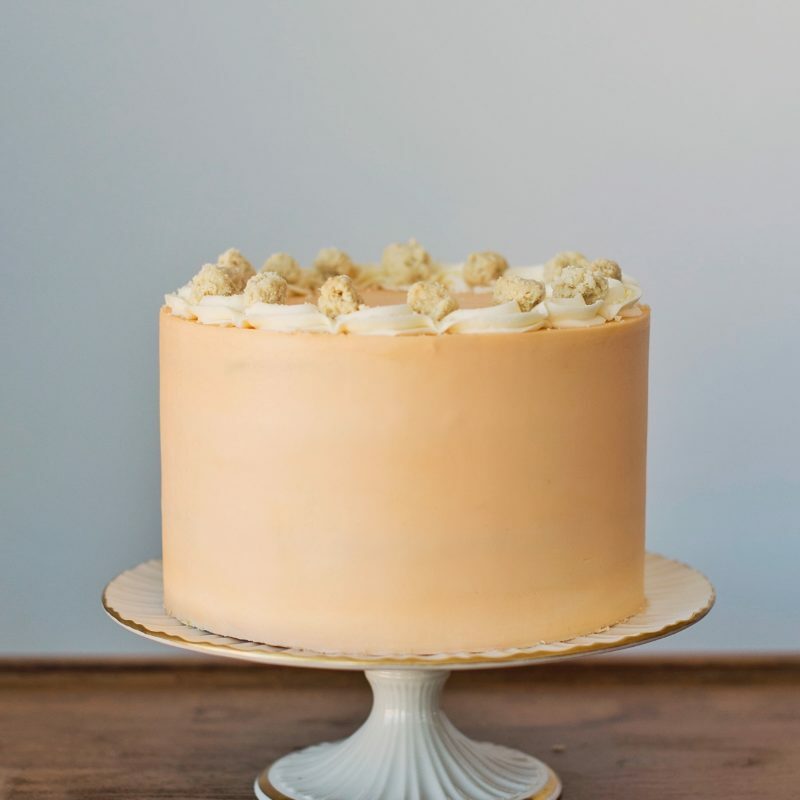 Would you recommend making half of the recipe to get a smaller cake? If not, any other recommendations? I am going to attempt this for thanksgiving! But I’m scared of doing the 6 layers. The 3 layers are fairly delicate but going even thinner scares me. Any tips on preventing the cake from falling apart when trying to assemble? Ok, so what I do, is divide my layers but keep them stacked and wrap them to freeze them so they are more firm to move around and stack the cake with. I also use a cake leveler to level the cakes and then a cake lifter (which is like a giant spatula) to move them as I stack the cake. Hopefully that makes sense. Thankyou! Also, is the shortbread crumb recipe correct? Should it have sugar in it? i have made a few cake by courtney recipes and they have all been amazing! this recipe was pretty disappointing though. i made it ON thanksgiving (it took 3+ hours) and the cake was just fine. i would have been happy to bake for that long (while my family was all waiting…) if the cake was incredible, but the only adjective that came to mind when i took a first bite was that it was “fine.” two stars because the toasted marshmallow frosting was really yummy contrasted with the rich and spicy pumpkin flavors, but there just wasn’t enough of it when assembled according to instructions to redeem this cake. 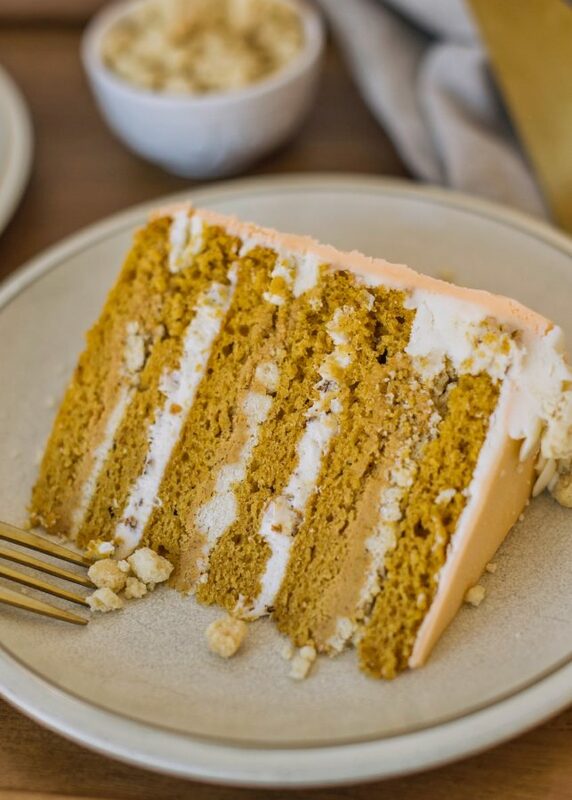 if you looooove pumpkin (and i list myself in that category), it might be worth a shot, but be aware that you will be baking for a very long time.